One of my favorite writers is Elizabeth Skoglund. See the link to her site on the left-hand side of this site. Do you need a word of encouragement? Do you ever wonder how you can keep pressing on when so many obstacles get in your way? Then here’s a book for you. 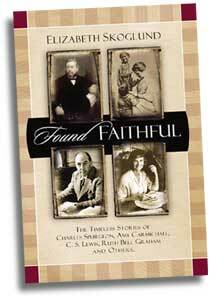 In Found Faithful, you’ll read about the trials and tribulations of eight “heroes” of the faith: C. S. Lewis, Charles Spurgeon, and Amy Carmichael, to name just a few. When we hear others talk about them, they often sound like spiritual giants, yet when you read Found Faithful, you’ll discover that they had very real struggles with physical, spiritual, and emotional hurdles. Recounting these ordeals, Elizabeth Skoglund helps you find them to be real people, accessible, and thoroughly faithful to Christ. Published by Discovery House. Check it out. It's an excellent read and well worth your while.